Artist Lorenzo Triburgo employs visual connotations of landscape and portrait photography to cast a critical lens on notions of the “Natural” and the politics of queer representation. Lorenzo has been featured on Slate, Huffington Post, HuffPo-Live and the “The Transgender Studies Reader 2” published by Routledge. His artworks have been exhibited in major cities in the U.S., Europe, and Asia and are in the permanent collection of the Portland Art Museum. His project Transportraits won first place in the international Pride Photo Award based in The Netherlands and he was awarded the Portland Regional Arts and Culture Council Grant for his project Policing Gender, addressing mass incarceration from a queer perspective. Lorenzo currently tours with Policing Gender hosting arts and activism workshops in the context of prison abolition. He holds a BA from New York University in Photography and Gender Studies and an MFA in Photography and Related Media from the School of Visual Arts. He lives and works in NYC and teaches art and gender studies online for Oregon State University and the School of Visual Arts. Jess T. Dugan: Hi Lorenzo! Thanks so much for taking the time to speak with me. Lorenzo Triburgo: Hi Jess – I’m so excited to be talking with you! JTD: Let’s start at the beginning. What was your path towards art-making, and at what point did you decide to focus largely on photography? LT: I feel like I arrived at feminism and art at the same time. It’s kind of interesting and I never really put it in this context before, but there are three things that formed my identity when I was an early teen: feminism, being a female drummer, and making photographs. In my teen years I realized photography was the perfect medium for addressing and exposing the falsities/hypocrisies I witnessed. Perhaps what I’m describing is teen angst. For me, it came in the form of feminism and manifested itself in photography. I went on to study Photography and Gender and Sexuality Studies concurrently at NYU. This intersection is something I’ve been interested in as long as I can remember. JTD: Your biography states that your work “consistently confronts the overlapping ideas of American identity, authenticity, and photography's critical role in framing and constructing our understanding of identity and reality.” Before we get to your newest project, Policing Gender, I want to ask you about your earlier series Transportraits. How did you begin this series and what were you hoping to communicate by making it? Have you completed this project or is it ongoing? JTD: It is sometimes assumed that LGBTQ artists must make work that is somehow related to their identities, which of course is not true, but in your case, your personal identity and your work overlap significantly, which I would also say about my work. How did you come to make work about LGBTQ identity? Did you make a conscious decision to create socially and politically motivated work, or were you drawn to it instinctually (or a combination of both)? LT: Such a good question. In my case, I am specifically concerned with and fascinated by the relationship between queer feminist politics and photographic images. Not each one alone, but their interconnectedness. The personal is political and the visual is political. This is paramount. Then, because I tend to know that I want to make a project around a specific idea/concern (masculinity, deviance, criminalization), I go into a period of research, including talking with as many people as possible, writing, reading, thinking, and visual experimentation. When I am in the creative process I feel myself striving toward something, seeking incessantly. I don’t know exactly what I’m looking for but I know it comes from both within and without of me. At a certain critical point, when I hit upon the right balance of my personal narrative, political concerns, and aesthetic values, I know I’ve found it. JTD: Tell me about your newest project, Policing Gender. In you statement, you write, “In Policing Gender, as in my previous body of work Transportraits, I employ visual connotations of landscape and portrait photography to cast a critical lens on notions of the “Natural” and the politics of queer representation, this time in service of prison abolition as a crucial queer issue.” What was the impetus for beginning this series and how has it progressed? LT: When I began Policing Gender I collaborated with the queer prison abolition organizations Black & Pink and Beyond These Walls to become pen pals with over 30 LGBTQ-identified prisoners. It’s like what Susan Sontag says in Looking At War--the same violent war photograph can be used for either pro- or anti-war propaganda. For similar reasons, I decided not to create portraits of my pen pals who I met after their release, or who I talk with regularly via skype. If I wanted to make the portraits, I could have--but to what end? Instead, I recorded audio and in Policing Gender the viewer hears compilations of my pen pals’ voices mixed with ambient sounds recorded on-site and from the background of our video chats. During this time I also recalled a lecture by Cathy Opie where she cited renaissance portraitist Hans Holbein as a major influence on the formal qualities in her work. I began looking at Holbein. More than anything, what stood out to me was the use of fabric. It’s this symbol of wealth, power, and beauty in their work. I kept thinking, I want to make a portrait, but not a portrait. When I saw this connection, it clicked. I decided to create fabrics that serve as backdrops. But with no figure, the absence becomes the subject. The aerial landscapes in this series were photographed from a hot air balloon and are about the act of looking. Of note, the first aerial photographs were created from a hot air balloon by Nadar in the 1850’s--this was perhaps the beginning of photography in the service of grand surveillance. You’ll also notice that in my aerial images, where there could be grandiosity, instead the land is hemmed-in and constrained. 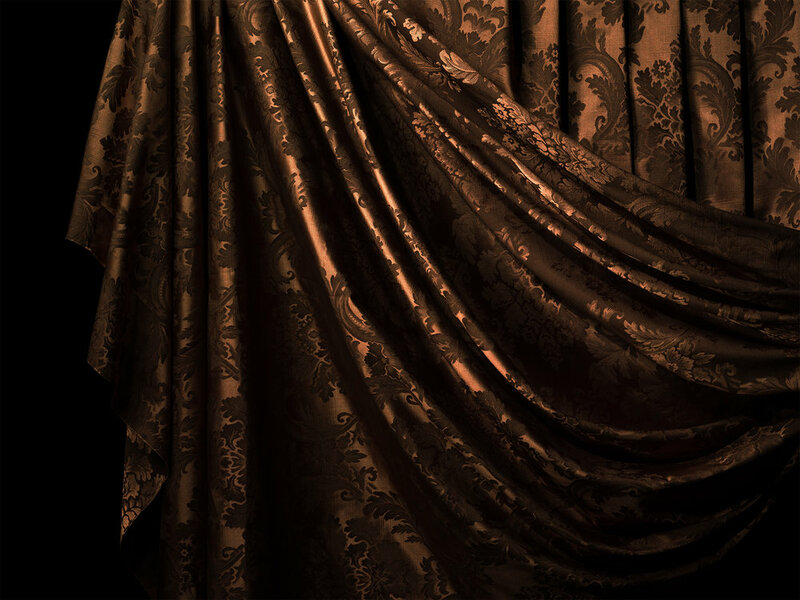 These images serve as a counterpoint to the fabrics. There's a bit of a dichotomous relationship between them. The fabrics are staged and lit in the studio -- tactics used by portraitists, but more importantly here, used by the pioneering photographic artists who disrupted the visual norms of the medium and queered photography -- Cathy Opie, Lyle Ashton Harris, Glenn Ligon, etc. Meanwhile, the aerial images are taken "in the field," use black and white, and reference the aesthetic that presumes to show "truth,” -- so called “straight photography.” I am employing an intentional clash in photographic tropes and aesthetics. In terms of why I started this project -- at a recent talk in Bern, Switzerland someone asked me if my pen pals are in prison because of their queer identities. I took a moment, then responded, ‘You tell me. Right now there are 1.6 million youth facing homelessness/houselessness in the U.S. We know that 46% of these youth are LGBTQ identified. Add to that, cities across the U.S. are increasingly passing laws that ostensibly make it illegal to be homeless. Over the last ten years there’s been a steady increase in the number of cities that have made it is illegal to lay down, sleep, or even sit in public and (in cities like Houston) to share or give food to people. Once queer youth are arrested and detained they are more likely to be sentenced to jail time and serve longer sentences than their non-LGBTQ peers. We also know that people who have been arrested have a higher chance of returning to jail or prison. So, these youth grow up to be LGBTQ identified adults with a much higher chance of spending time in U.S. prisons. This is especially true for people of color, youth, immigrants, differently abled, and poor people. So, are queer people in prison because they are queer? If we look at the systemic level, rather than a matter of individual choices, the answer is yes.' Remember when I mentioned my impetus as a teenager to use photography to address the injustices around me? That's the beginning of my pursuing this project. In terms of how the project has progressed -- alongside the photographs and audio that comprise Policing Gender I host workshops and events that address the prison industrial complex and engage community members with prison abolition politics. For example, this summer Policing Gender was exhibited at BGSQD – NYC’s only queer bookstore, gallery and event space located inside The Center in the West Village. I teamed up with Drae Campbell to host a Policing Gender themed version of Drae’s monthly, queer, storytelling event “TELL.” It was the Pride month event and it was an incredible night. We invited formerly incarcerated LGBTQ folx and queer prison abolition activists to share their stories. I think everyone left feeling like they participated in and witnessed something important. It was also empowering to host this event during NYC Pride in a space of such historical importance to the LGBTQ rights movement. My goal is to bring Policing Gender to every state in the U.S. So far I have hosted events and exhibitions in California, Missouri, Oregon, NY, Washington, and Illinois. JTD: I imagine the experience of corresponding with LGBTQ-identified prisoners would be both incredibly difficult and also potentially rewarding. Can you expand on what you have experienced or learned through these exchanges? LT: Yes, and you are right. Before making any images for the project I began writing letters with 32 people on the inside. That number continues to grow as info about Policing Gender gets shared among prisoners. I made a commitment to connect every prisoner who gets in touch with me to a pen pal on the outside and I continue to do this. I also continue to write with a number of people that I have now known for 2 years. Writing and receiving letters is incredible. On one level, it’s just fun, like any other pen pal relationship. Getting letters and notes in the mail is awesome. On another level, it is profound. From the onset, I made the decision to approach every letter without preconception or judgment. I never ask my pen pals why they are in prison. It’s liberating to get to know someone in this way. It’s hard for me to talk about this without sounding schmaltzy or without worrying about sounding schmaltzy. My best answer is that it is indescribable and everyone should do it! Please contact me if you have curiosity about being a pen pal! If you are reading this, you should do it! JTD: In what ways do you view this project as being in dialogue with other photographic work about the prison system- work by Amy Elkins, Stephen Tourlentes, and Deborah Luster, to name just a few- and also with LGBTQ activism around prison abolition? LT: I think the emergence of work surrounding the prison system is a testament to the severity of the issue and to the activists who have worked to bring it to our attention. Artists across mediums are increasingly compelled to create work addressing the prison system. My friend and colleague at Oregon State University Julie Green comes to mind. For The Last Supper, Julie paints ceramic plates with the last meal requests of prisoners who are put to death in the U.S. She has painted 700 so far and will continue to make them until capital punishment comes to an end. Curators Yaelle Amir and Pete Brook (in my opinion both brilliant) have each in recent years curated group shows about the prison system: To Shoot a Kite and Prison Obscura respectively. We see Dread Scott’s Lockdown, Josh Begley’s Prison Map. I am also glad you mentioned Amy Elkins. Black is the Day, Black is the Night is beautiful but also pensive and sharp. What’s important for the photographic artists I am in conversation with is an approach that acknowledges the specificity of photographs – that employs photography beyond its descriptive abilities. My hope is for Policing Gender to also be in conversation with artists such as Chris Vargas and Reina Gossett – artists for whom institutional critique is at the fore. JTD: Do you view this project as being complete or is it something you plan to continue working on? LT: Policing Gender is a completed series. Now I get to experiment with installation techniques and am finding it super interesting to work with the size of prints and the audio component in specific spaces. JTD: For anyone interested in finding out more information about LGBTQ prisoners and prison abolition and how they can get involved, what resources do you suggest? People can also write to me directly (lorenzo@lorenzotriburgo.com) with questions about or interest in becoming a pen pal. LT: I just received a grant in the amount of a ridiculous sum of money to create my dream project – Flock of Poodles. I have been talking about this for years! I will finally get to buy a mansion and fill it with every size poodle there is. And take a photo that David Lachapelle wishes he took. Imagine! LT: In all seriousness, I am in the production stage of two new projects that will shoot all through next year. It’s a cardinal rule not to discuss artworks that don’t exist—all I can say is that my Casting Call for one of them will start in December.